Dr. Dan Sullivan explains the power of the chiropractic adjustment and goes into detail about why chiropractic is NOT about pain, but about changing lives. To increase your certainty in the true power of chiropractic. 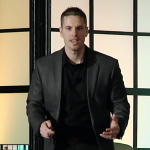 Dan Sullivan, D.C. graduated from chiropractic college in 2004 and, within four years, had built one of the largest practices in the profession with 1000 visits a week. He has since completed the Academy of Chiropractic Philosophy Diplomate Program and launched www.chiropracticadvocate.com to help bring certainty and vision to chiropractors. Life University’s LIFE Vision Seminar provides ongoing inspiration and a community for likeminded, purpose-driven chiropractic professionals. LIFE Vision is a two-day shot of high-energy, high-impact inspirational and educational moments as well as practical, skills-oriented break-out sessions. These seminars, which take place multiple times a year, are designed to bring current and future chiropractic leaders of vitalistic perspectives together to connect and recharge. Learn more at LIFEVisionSeminar.com.